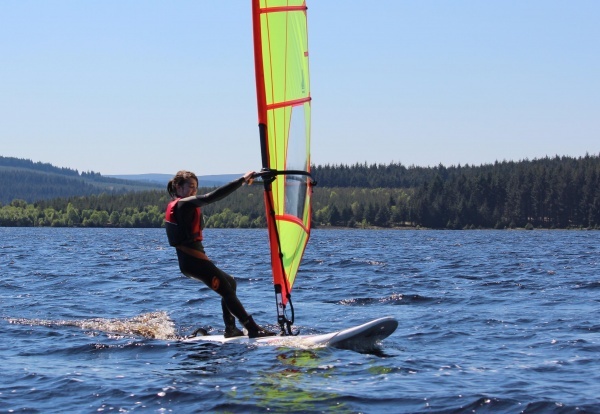 Windsurfing at Kielder Water Sailing Club (KWSC) was given a boost earlier this week in the form of a £9000 grant from Sport England. Over the past few years, windsurfing at Kielder has been on the crest of a wave, as Windsurf Instructor Brian Coates explains: "In just a few short years Kielder Water Sailing Club has gone from no windsurfing to a successful Team15 youth racing team and Royal Yachting Association (RYA) Training Centre recognised for all levels, from Start Windsurfing through to freestyle, racing, intermediate and advanced skills." "The £9000 Sport England grant is for our windsurfing project "More Families Afloat More Often," said KWSC Chief Instructor, Julie Gibbon. "This builds on our "Families Afloat" project which began in 2012." "The new grant will allow us to buy a number of intermediate windsurfing boards and rigs and a trailer to transport up to 10 boards and rigs to windsurfing events, both in the north east and country wide." "I love windsurfing because it's an exciting sport that anyone can do. Kielder is a great place to windsurf and, because the lake is shared with other water sports, it gives you the chance to try new things. There's a lot of equipment available that anyone of any age can use; there are opportunities to become an instructor and/or race in a team and everyone is very supportive." "Kielder Water Sailing Club is also a friendly and family orientated club with an active social calendar," continued Brian Coates. "New members, whatever their experience, are always welcome. So if you are a windsurfer already, or just fancy having a go, please come along to the club and see it for yourself." May 2014 is National Watersports Month and Kielder Water Sailing Club is one of many clubs around the region taking part in the RYA Push The Boat Out weekend on 17/18 May 2014. The club will be open to visitors from 10am to 5pm on Saturday 17th May. Visitors can take a trial sail on the lake with an experienced club member and afterwards enjoy food and drinks from the club galley and soak up the friendly, family atmosphere. Anyone wanting to sail, please bring some old clothes and a wet or drysuit, if you have one. Buoyancy aids will be provided.